I was just settling down to watch Corrie last night when quite a few caches came out not too far from home. There was #1, #6 and #7 of a series round Apley Castle near Wellington and a whole trail of caches along the old railway line between Stafford and Newport. The Apley Castle ones are decent sized containers but numbers 2-5 are obviously still waiting to be published. The Stafford / Newport ones are virtually all micros (not our favourite cache size at all). I went for the Apley Castle ones as we know the area from visiting for 4 old caches that are there (3 of these are now sadly archived) and it has a special place in our hearts as one of the first caches we ever found was there. On the way, I had the WiFi network in the Jeep on and my iPhone constantly checking to see if numbers 2-5 had been published. By the time I arrived they still had not come out so I set off anyway. After parking up on the A442 in the fisherman’s lay-by, I vaulted the wall and waded through chest high nettles, only to find out that there was a gate with a perfectly good path not 20ft from where I’d vaulted the wall – doh! The first cache was a quick find, after I initially checked the wrong mossy log. A nice FTF too! I then headed off round the lake to the next cache. This one took me a good while to find as the co-ords were pointing to the edge of the lake but after wading through the nettles and not seeing a cacher’s trail that the cache owner must have surely left when they set the cache, I spotted somewhere else on the other side of the path. A quick dive into the bushes there yielded the cache. Another FTF :-). As I was walking off to the next cache, some muggles were coming towards me and the customary “are you geocaching” was said. It was Greygeeza – great to meet you all at last. We had a nice chat before continuing on our ways. 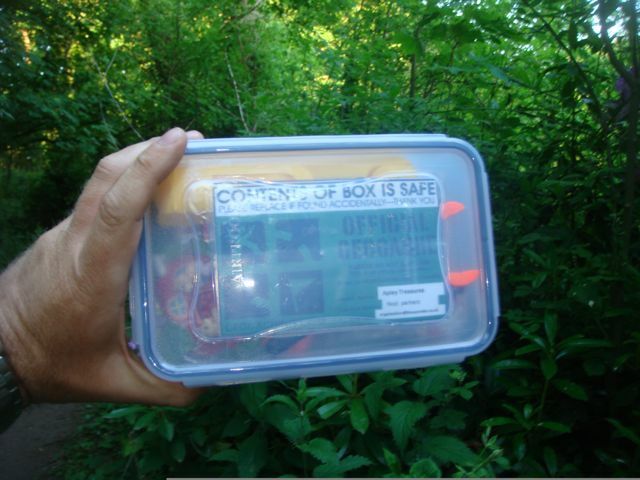 They had got their first FTF on the remaining cache – nice one! The last of the three caches was a really easy find. I then checked again and the missing 4 caches still had not been published. The cache pages for the ones I had found gave a few clues as to the route to follow to find the missing 4 caches, but there were just too many places to check to have a hope of finding them. If I had more time, I could probably have found one or two, but we’ll just wait for them to get published and do them properly I think. On the way back to the Jeep, I bumped into Greygeeza again so we stopped for a chat. We lost track of the time and it was soon going dark, so we both headed off to our respective homes – they had their first FTF and I had 2 FTF’s – a good evening’s caching for everyone :-).